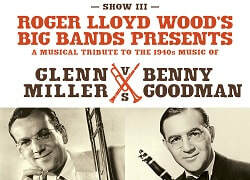 Please join us for a musical tribute to the 1940s Big Bands. Experience an incredible afternoon of live 1940s music. Battle of the Big Bands features 2 Big Bands with 30 Musicians. Each group will perform the music of a legendary band. This year it is Benny Goodman and Glenn Miller.